I have been waiting for summer to start since June. But June Gloom deepened into July Gloomed, followed by an August that was generally lovely but far more temperate than this Southern California girl was used to. My tomato plants were uncharacteristically subdued, my peaches never ripened, and All this time I’ve been waiting for the long stretch of hot days, the salad weather, the BEACH weather. But now it’s September 23, and by all accounts summer is officially over. We are moving into apple season, people care that there is a shortage of canned pumpkin, and dinner by the fireplace is starting to seem more appealing than dinner on the deck. So this is a last gasp summer recipe. Celebrating the bounty of the summer that wasn’t. But even a cold summer has its consolations, and one of those consolations is corn. Corn on the Cob is a classic of course, but as a gaptoothed child and later an adolescent with braces, I never really liked gnawing the kernels off the cob. I prefer the flick of a sharp knife and the resulting flow of kernels, with nothing coming between your mouth and bursts of starchy sweetness. 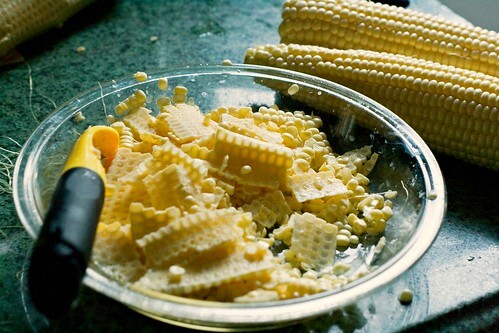 Of course, once the corn is off the cob, you can start to experiment with flavors besides just butter and salt. I like sauteing the kernels with some butter and hot sauce, or doing a lime juice, mayonnaise and cheese based elote. But the most decadent corn dish I’ve tried, the one that was like corn on crack with almost overwhelming umami, is David Chang’s Roasted Sweet Corn with Miso Butter from the Momofuku Cookbook. This isn’t that recipe. I did make it once, and it was delicious, but it involved making four separate recipes (and I even fudged one of them) to combine into one dish. What I’m giving you today is an adaptation — lighter and more streamlined, but just as delicious. You still get the incredible umami hit from the miso, the sweetness of the corn, and the smoke of the bacon, but this takes only a few minutes to make, and dirties far fewer dishes. 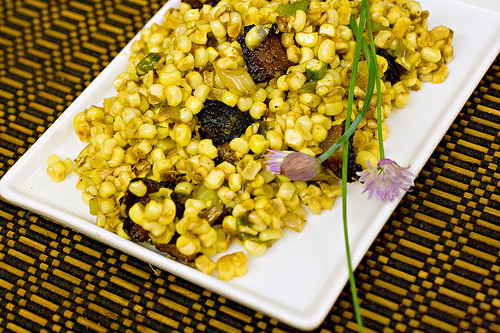 And if your summer has come and gone, you can make this with frozen corn. The beauty of cutting corn off the cob and tarting it up is that you end up with a year round dish, and your summer can go on and on and on. 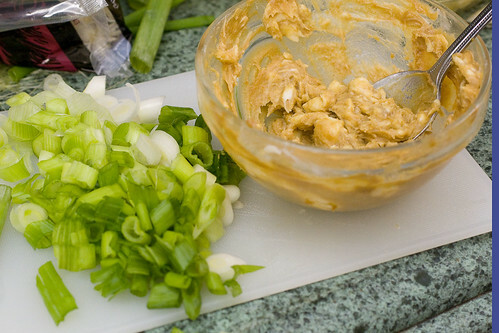 In a small bowl, combine the miso and the butter, and stir until the miso is incorporated into the butter. This may take more stirring than you think you'll need, as the paste is thicker than the softened butter. Try very hard not to eat it all plain. Chop the bacon into rough 1.5 inch pieces. In a large, high sided skillet over medium heat, fry the bacon until it's crisp. Remove the bacon with a slotted spoon, lower the heat, and in the remaining bacon fat, fry the scallions until they're softened but not brown. Add the corn, and cook, stirring and flipping, until the corn is cooked through, but still has some bite. Add in the miso butter and combine until the corn is glossy and coated with the butter mixture. Add the fried bacon pieces, and serve. Try to share. Just voted, Stumbled, and now I need to try some of your yummy miso buttered corn. Simply decadent, love that! I love miso butter!!! I did a similar variation on the Momofuku cookbook’s with Asparagus last spring. It’s absolutely addictive. I’m always up for anything with miso butter..This looks like comfort food at it’s very finest! I just made this last night. It was so easy and one of the best things i have ever made. This will now be my go to summer dish. Just saw Mr. Chang make this on the PBS’s Mind of a Chef — he topped this with a poached egg. Looked extremely delicious!